This bed is about as different as it gets from the one we posted about yesterday. This piece from reader Notzombiefood is all about fun for kids. Quite honestly it represents all things that are great about kid beds — it’s big, sturdy, and can be made into a fort if necessary. Notzombiefood says that he added a few shelves and desk space for his youngsters’ gear. That’s one heck of a tall order for one piece of furniture; however from what we can see from the photo he seems to have achieved his goal on all levels. Also, that’s a badass ladder. The front legs don’t appear plumb…are my eyes being tricked? Yup, it’s the photo. I can guarantee everything is as straight and 90 degrees as can be. I built it modular because I had to disassemble it to put it in his bedroom. 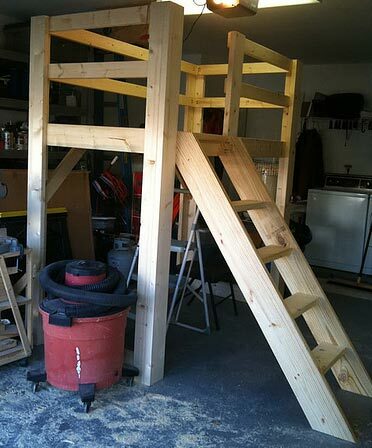 The ends are one piece, the ladder comes off as one piece, and side rails and sleeping surface comes out. Pretty easy to move and put back together. This spring I’ll disassemble and the son and I will have a good time painting it with some Disney red, green, yellow and blues. I haven’t put up a camouflage curtain yet, but that’s the next project. Very nice. Now I want one… for myself. Your son is pretty lucky to have you for a dad, NotZombieFood. “put it in his bedroom”? You mean your son is not going to sleep in the garage? What kind of a Toolmonger are you raising? Aww shucks… thanks. I try my best. That’s the best any of us can do I guess. He did try to sneak into the garage with his blanket right after I finished it but before he got it for Christmas… so he’s on the right track. haha. Ok, that’s fine, but where should I mount the big plasma screen, the beer fridge and the Nerf full auto machine guns?? Nice work! Are plans available online somewhere? I didn’t buy the plans however. I took the dimensions of the mattress, added 1 inch each way, and designed the bed around it. The one thing I did take away from the above link was using a 2×4 and a 2×6 for the posts. Works great. Basically, the online plans are to make it easy. They come with lumber dimensions and what bolts you need and templates. I preferred to build it a little different and used pocket hole screws (Kreg) and some deck screws instead of the bolts. They hold very secure and with the deck screws I’m not worried about any screw shear. The pocket holes added a bit of time to the project but I think it was worth it in the long run. No long bolt threads to scrape against. I also added some yellow playground handles just above the steps to the bed. Let’s him have something to grab onto as he climbs in bed when he’s tired. The whole project took about 2 days and cost about 150 bucks in materials, minus the mattress. I’ve added my own creation in the pool, since the trend is beds! That’s some great work too! Nice recessed plugs. Love the light switch / receptacles / rope light idea. I’m gonna steal that idea if that’s alright with you? Of course! There are rope light mounting brackets (Menards here in Illinois) to make the job easy.